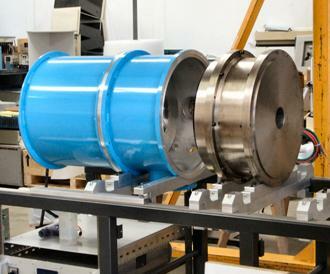 The first section of our linacs is an ion source and low energy beam transport (LEBT) system. The ion source is a microwave ion source, which produces a 25-keV, 30-mA, dc, proton beam with low emittance and high proton fraction. It can also produce a 40-keV, 25-mA deuteron beam. A drawing of the injection system is shown below. The total distance from the ion source to the RFQ is 540 mm. The focusing element in the LEBT is a novel dual-solenoid magnet utilizing two separate tape-wound, edge-cooled coils. The upstream coil produces 25,000 Amp-turns for a current of 85 A. The downstream coil produces twice the Amp-turns for the same current. An x,y steering magnet is suspended from the front of the solenoid. Drawing of Microwave Ion Source and Magnetic Solenoid Lens. Ion Source Housing and Solenoid Lens. Web site and all contents © 2013 Ion Linac Systems, All rights reserved.